Join us for Indie Bookstore Day, a national celebration of indie bookstores. This is the 5th year we will be celebrating our love for books together! We have planned a fun day of festivities, and for the truly dedicated there again will be the Passport Challenge. Limited edition, one-of-a-kind book themed merchandise: shop for exclusive items commemorating independent bookstores, such as Literary Map of Seattle poster, pins, bookmarks, tote bags, and more! Snack and refreshment table, stocked all day to give you the energy you need! Become a Grand Champion: visit all 22 stores and get 25% off for EVERY book purchase at ANY participating store, ALL YEAR LONG! Libro.fm listeners who’ve made the choice to support local bookstores and communities wil be rewarded with free audio books. Click here for more information. 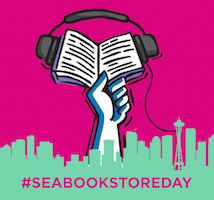 For more information on Seattle Independent Bookstore Day, please visit @SEABookstoreDay on Facebook or go to seattlebookstoreday.com.